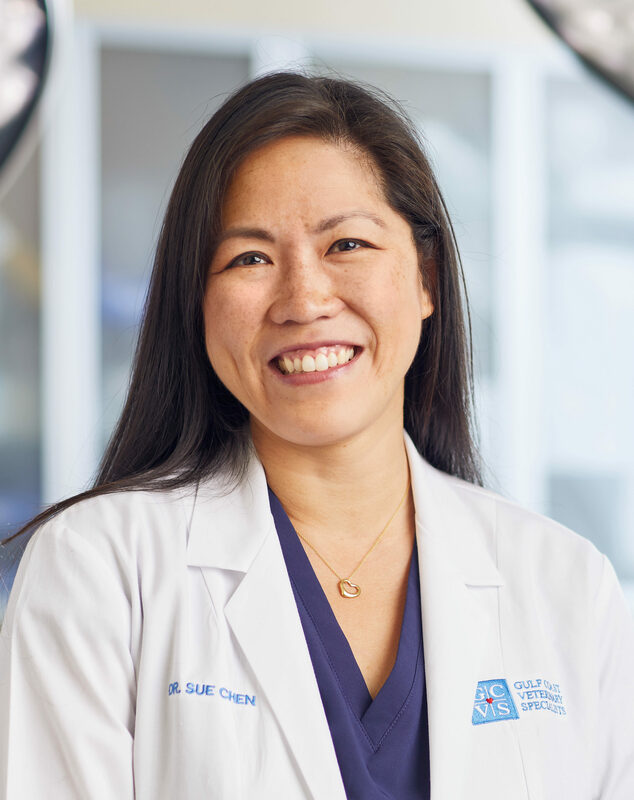 Dr. Sue Chen is a native Houstonian and is board certified in Avian Practice by the American Board of Veterinary Practitioners. She received her DVM from Texas A&M College of Veterinary Medicine, where she created a specialized veterinary curriculum track focused on exotic animals. She spent time training at zoos and wildlife sanctuaries in Dallas, Seattle, and Australia, as well as a pathology rotation at the Smithsonian’s National Zoo in Washington, D.C. After veterinary school, Dr. Chen completed an internship at Gulf Coast Avian & Exotics, followed by a residency in Avian and Exotic Pet Medicine and Surgery at the Animal Medical Center in New York. She has authored publications on avian and exotic medicine, and has a special interest in the use of hyperbaric oxygen therapy and endoscopic surgery in exotics. I would never take my guinea pigs anywhere else to be treated. GCVC has been amazing to us. We love Dr. Chen and the amazing staff that have helped us.